Friday Fives: Top 5 New MAC products! When I say "new"...I mean new to me, ones I have never tried before...they may have been around for a while but it's the first time I have personally used them. I got some birthday money from my parents that I hadn't yet spent, and so last week I decided that I'd use it to indulge myself in some new make up - I have been feeling so unwell and run down lately and I really feel that its taking its toll on my appearance - I have always been lucky with my skin and never suffered with spots but lately I have been getting lots of pimples, and just generally feeling unattractive. 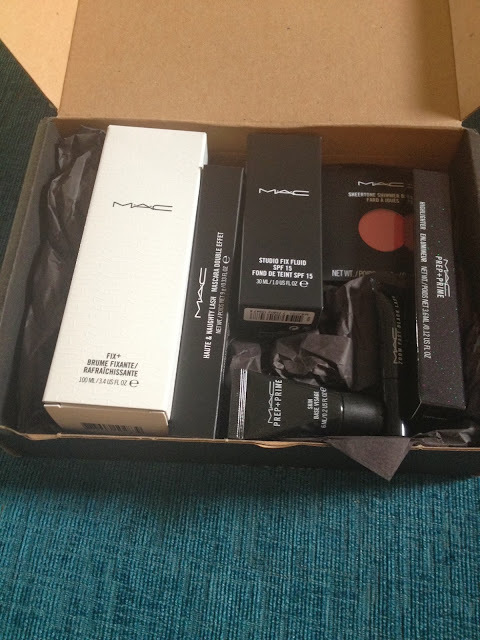 So I thought new make up might act as a bit of a pick-me-up - and since MAC has always been top of my favourites list, I of course headed straight to their website! I knew there were a couple of specific products that I wanted to try after seeing Liza from Glambeautys vlog about them - the Fix + spray, and the Prep & Prime Highlighter. And while I was there I browsed the site and picked a couple of random things too - the Haute & Naughty Lash Mascara to try out, my old favourite Powder Blush in "Dollymix"and a new bottle of Studio Fix Fluid foundation because I ran out a while ago and it's still my favourite. Because I had spent over £80.00 (eeek!) I was also sent two samples - a sample of Zoom lash mascara and a sample of Prep & Prime Skin Base Visage. 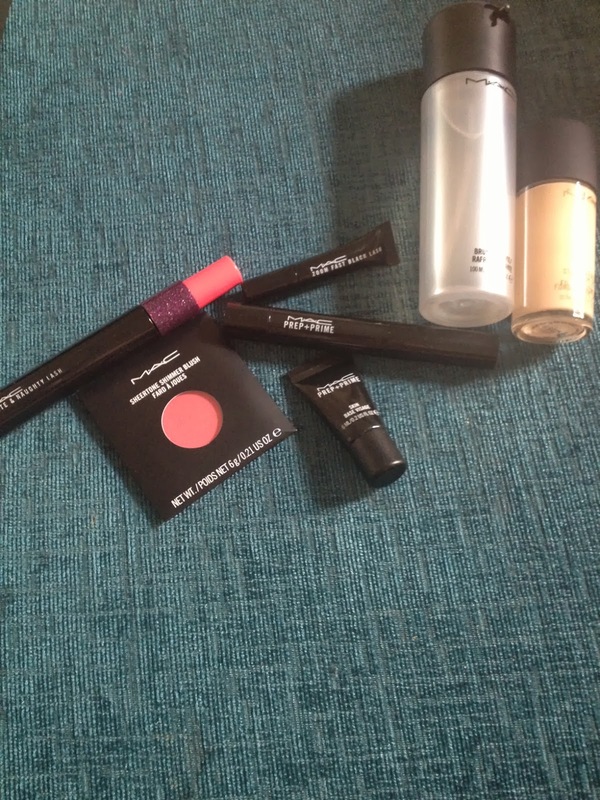 The items arrived today and so I have been spending the day trying them out - I thought I'd give you a run down on my 5 favourites from my order and what I think of them so far. I was really intrigued by the sound of this mascara as it contains not one, but TWO mascara wands - One gives more a more subtle look, and one loads the lashes more to give a more dramatic, thicker lash look. I loved the look of the product, and the way that one wand is effectively stored inside the other - I found it a much sleeker design than the usual one-wand-each-end approach taken with dual-effect mascaras. I tried both wands - the subtle effect gave a nice, natural look which seemed to elongate my lashes. Whereas the dramatic wand really did apply the mascara much more thickly, instantly creating a more noticable effect. Because I prefer a dramatic mascara look, I will wear use the dramatic wand much more often but I think the more subtle wand is perfect for use on the lower lashes. This fixing spray contains green tea, chamomile and cucumber to calm the skin so is perfect for spritzing over the face before applying make up - and for spritzing afterwards for fixing make up! I was intrigued to see how well this would work - but I honestly think it made a real difference to how well my make up stayed put! I applied my make up today at 5pm, went out shopping, came home, cooked dinner, watched TV...when I went to the bathroom at around 9.30 pm and looked in the mirror I thought to myself "Wow my make up looks as though I've only just put it on"...then I remembered I'd used the Fix +!! I honestly think it made a real difference as I usually feel like my make up wears off very quickly. However one thing I will point out is to be careful applying it after you've just applied mascara - I may have used too much or not waited long enough after applying my mascara - but it left me with mascara streaking down my face!!! Eeek! This was one of my samples, and I am so glad I got to try it as it's probably not a product I would have ordered - but now having tried it, its going straight onto my Christmas list! It's designed to calm & soothe the skin, blot away excess oils and smooth away redness - improving the application of foundation or powder. I absolutely loved the feel of this and thought it gave a great base for make up. I REALLY want the full size. I have used Studio Fix foundation for several years now, ever since I read that it was what Paris Hilton uses! I have tried MANY other foundations - Laura Mercier, Nars, Elizabeth Arden, L'ancome - none of them were cheap and NONE of them lived up to MAC's Studio Fix for me. It is a VERY heavy coverage which may not suit everybody, but that is exactly why I love it - it lasts for hours too. I have recently been using Bourjois Healthy Mix foundation which I have been very impressed with as a low-cost everyday foundation, but I am pleased to have my beloved Studio Fix back in my life! I have wanted to try a decent highlighter for a while, and I recently watched one of Liza's vlogs in which she mentioned this one...so I decided to give it a go. I followed her tips on how to apply it, and although I think I need a little more practice with it I do find it helps with highlighting my cheekbones and other areas. I'm looking forward to experimenting more with it! Have you tried any of these products? What MAC products would you recommend to me?! As always, I'd love to hear from you! Oh and I'm lusting after your jumper now as well haha. You look lovely! I love the eye makeup, those colours look great on you, that's my fave mascara!